Question: Which heat shrink sleeves should I use on a riser pipe? Answer: First let's discuss what a riser pipe is (for those who may not know). I've heard 'riser pipe' used to describe a couple of different pipeline scenarios. A very crude and exaggerated example of what a subsea riser pipe might look like. In a case like this; the riser pipe will be exposed to forces that a 'typical' pipeline will not see. Since this pipeline is vertical it can be more prone to movement caused by currents, etc. This riser pipe can be in a position to see more 'collisions' from materials floating in the sea and following the currents. Particularly in she 'splash zone' - where the pipe will be subject to crashing waves; surface floating debris; and ever changing tides, this pipe is going to take a beating. 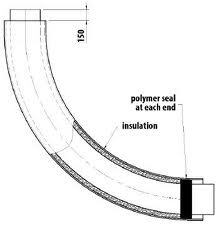 We do have heat shrink sleeves for exactly these riser pipe applications. In general; we do not recommend using a mastic sealant but instead are more comfortable offering an adhesive based sleeve. These sleeves will be unaffected by all of the forces mentioned above. In fact; our ROCS product (which was originally called a Szar Shrink Sleeve) has been used often in such cases to excellent results. Before we can offer ROCS, we would of course need more details about the pipeline. We would need to know things like operating temperature; factory applied coatings; etc (as indicated here). B: I have also heard 'riser pipe' used to describe the specific area where an onshore pipeline comes up out of the ground. In such a case; it can be a uniquely complicated issue as the heat shrink sleeve needs to be one that can withstand a buried environment (subject to soil stresses) and must withstand a potentially 'sub sea' like environment (in terms of being immersed in standing water) and must also be able to withstand UV and black body temperatures caused by the sun (if in direct sunlight). Those this does sound complicated; it really isn't. Nearly all of our sleeves are designed to withstand all of those conditions. The reason I can't say 'all' is that blackbody temperatures can reach the mid-high 100's (Fahrenheit) and that would exceed he operating temperature of a few of our sleeve options. Just in case you just skipped to the bottom: YES - we have shrink sleeves that are approved for use (and do a fantastic job) for riser pipe applications!